cloasters the power usage really isnt that bad at all. It is so much more to do with the quality of your power supply than it is to do with the power output of it. It is definately worth buying a lower rated premium brand PSU, than a high wattage generic, or average brand unit. I agree, absolutely. Both of my machines have PC Power & Cooling power supplies in them. I was happy with an Enermax 460 for quite a while, until it gave up the ghost with a 3 Ghz Prescott rig. so what is wrong with my comp i have enough power-and it seems when i dont run the settings as high on cs:s it doesn't crash WHY!!!!!!!!!!!!!!! Exactly what video settings are you using when it crashes during CS:S? What anti-alias and anistrophic filtering settings are you using? Screen res? I fix mine manually in the driver settings. I take it this is happening with the card at stock speeds as well? If I o/c too far css will crash after about 5 mins of play. The only time I've ever had similar problems is when I forgot to plug in the 4-pin connector to the end of my 6600GT, and that was because I didn't look at the manual and wasn't aware that the thing needed extra juice directly from the power supply. I'd load games and then my pc would just crash either immediately or minutes later, depending on how demanding the game was. It would be fine on the desktop and just doing average things. I doubt you made a mistake like this... but that's what did it for me. If the video card isn't getting enough power that easily explains your problem. Also, I had random reboots from an Antec 300w PSU when I upgraded from the KT-333 chipset and Athlon XP 2000+ to an nforce2 and Athlon XP 3200+, and of course I added a better heatsink than stock, a dvd burner, and a new sound card with that. It was obviously too much for my PSU, but when I got the Antec TruePower 550w all problems were solved. I doubt with 500 watts you'll ever run into a problem like that though... 550 watts is a bit overboard but I didn't want to take any chances with all the stuff I run at any given time. If nothing is overheating, and you are completely sure of that, it might be time to RMA. I would back up everything and reformat before I'd RMA though, because to me its just a huge and many times unnecessary hassle. Having old drivers present on the system can often cause problems, especially when keys are still written in the registry to initialize them - or attempt to. Running low quality RAM in dual channel also can cause random reboots or crashes. I haven't read every post in this thread but try reseating your RAM in slots 1 and 2 on the motherboard. You might want to find some kind of documentation on what your timings should be and manually set them. If overclocking the FSB, definitely consider loosening the RAM timings and giving your CPU/RAM more power. Errors like this would most likely only cause crashes, and not complete reboots, so that is probably not at the root of your problems. If you don't have the 4-pin power connector (the square one found on most PSUs, heh) plugged into your motherboard, then this can also cause random reboots and instability when the system is under stress. Make sure the 12 pin AND 4 pin power connectors are plugged into your mainboard. Again, I'd check to make sure nothing is overheating and that you've got the extra power connector plugged into the video card. Run every bit of hardware you have at stock speeds with standard drivers issued by your hardware's maker until the problem is isolated. This is exactly what happens when you aren't giving the card the additional power it requires directly from the PSU. Not trying to insult your intelligence or anything, lol, its just possible that you overlooked this. the 12 pin into graphics card and then wheres the other side go? ?/ mainboard?? not up on pc lingo- you mean mobo?? his card is a 6600GT, not a 6800GT, so there should not be an external power connector at all unless it is a strange model (i know there are about 1 or 2 that use external supplies but i dont believe his does). you could be onto something about voltage however. Does the P865 have AGP 8X, or AGP 4X? And also, can you tell what voltage the card is sitting on? Most motherboards run their VAGP a bit higher than spec, because most cards prefer it. ATIs like 1.55V best, and can some times be damaged by going more than that (i dont know about the X series, but the 9XXX series were like that and im assuming they still are). Nvidia cards have always like a bit more juice. Ideally you want between 1.6 and 1.65V to the AGP bus. 1.55 is default, but most boards give about 0.2V more. use a tool like motherboard monitor if you dont already have a voltage monitoring program, and see what it is, then increase the AGP volts until it sits between 1.6 and 1.65. Even people that dont have problems should try running their AGP a bit higher, as it often results in slightly better and more stable overclocks, particularly on the 6 series. xfx 6600 gt does need power on the AGP, the PCI-E dont.. Sorry, your right i didnt see that one. I was thinking of the PCI-E variety. Yea, on the XFX its a black molex connector on the top right of the card. When you plug it in, make sure that the molex you have plugged into it is comming directly from the PSU, and isnt shared with anything else. That is, dont have the same cable that is plugged into the 6600GT, plugged into the hard disk as well. Anyway, its a big relief to find out that it was only a simple mistake, and I say that from personal experience! And yes dsio, the AGP variant of the Geforce 6600GT does indeed require an external power connector, which is what I've got. To my understanding the 6800 cards require 2, and the 6600GT needs 1, on the AGP interface. 6800s need 1 in general, with some makers giving the ultra 2, and some giving it 1. I was surprised that the AGP version of the 6600GT needed it when the PCI-E didnt. I know the PCI-E bus can provide more power, but i didnt expect it to make that big a difference. Then there are some odd ones as well. The ASUS 6800NU gamers edition for instance which is on an Ultra PCB, and uses 2 connectors. now I am cr@pping myself. What will happen if I dont have a single line just for the vid card? Should still work, it's just recommended. My 6800 came with a power splitter, so they realise it will work, usually, on a shared cable. There have been scattered reports of people damaging their hardware by not running a dedicated line. The Video card becomes slightly unstable and often will not overclock as far for a start, but other than that the video card will not be harmed by it. 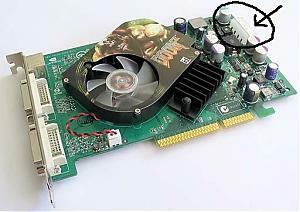 It seams that some people have had their AGP slots fried by the cards however, as poor quality power from the molex connector puts more pressure on the AGP slot's power supply. What is dangerous, is when you have variable devices connected to cable shared with the video card. If you have a hard drive for instance, that spins up after being powered off, it can actually harm all devices involved, and instability. Optical drives are just as bad. Fans and CCFL / Neons are generally OK, as are things like LCD displays, creative Audigy Drives, and most fans. Speed variable fans can cause a very serious problem as well. When you use a splitter and have both plugged into the video card it isnt an issue, because it isnt the fact that there are other things connected, that causes the problem, its the fact that the other devices usually vary their power usage. So dont be afraid of using a splitter.